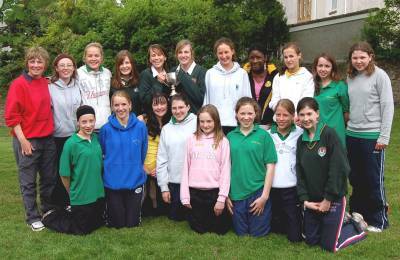 Ashton School, and its predecessors, Rochelle School and Cork Grammar School, have had fine sporting traditions stretching back over many years. The schools have produced many interprovincial and international players in a wide variety of sports. Extra curricular sport is an important element of school life in Ashton. 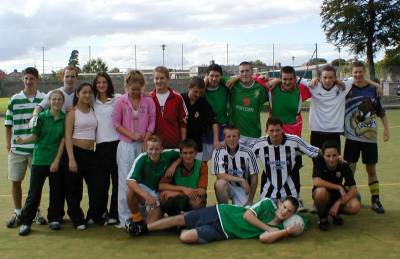 All students are encouraged to take part in the many sports that are available. These include hockey, soccer, basketball, badminton, athletics, tennis, golf and Gaelic football. Many students take part in sporting activities outside the school such as windsurfing, swimming and horse riding and if they wish to enter in inter-school competitions the school is pleased and willing to facilitate them. Mr Smith arranged a special visit by some of the members of the Munster Rugby team, winners of the European Cup Rugby to the school. 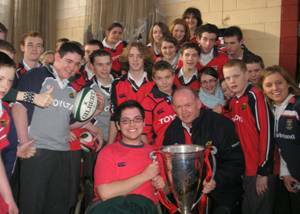 The whole school turned out to welcome Mr Declan Kidney, Coach to Munster Rugby and John Kelly, team member. Mr Kidney addressed an assembly and encouraged them to always do their best in every level of their lives and then very patiently stood for many photographs. 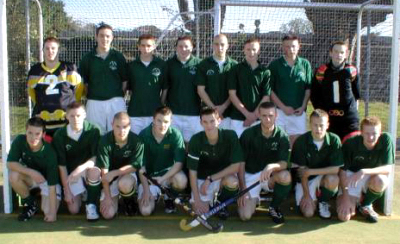 Hockey continues to be a popular sport in the school with boys’ teams in particular being very successful, winning the Irish Schools’ Championships in 1998 and 2000. Students are encouraged to participate in athletics and this is mainly done during the Summer Term. Some students are involved in local Athletic Clubs and they, along with students from other schools/clubs, take part in the South Munster Championships and if successful then move to the Munster Championships and ultimately the All Ireland Championships. A feature part of the Athletics Programme each year is the Annual Sports’ Day. Sports’ Day is always a popular day for students and, as well as the traditional track and field events, the day has evolved into a fun/activity with inter class tug of war competitions, informal soccer matches and finishes with inter class relay races before the final prize giving. The pride of the Ashton School sports scene is the magnificent floodlit astroturf pitch. This was officially opened by the Minister of Education, Mr.M.Martin,T.D. in November 1999. The pitch was constructed by the Board of Management at a cost of £350,000. The Ashton School Parents’ Association, Ashton Hockey Club, and the Department of Education and Science contributed towards the cost. March 14, 2018. Ashton Justice Committee present cheque to COPE Foundation.